Posted on September 18, 2017 by treelawyer	tagged. Summertime has run away from us like the sands of an hourglass. We are mere hours from the autumnal equinox (happens this Friday at 4:02 p.m. EDT, so be prepared to balance your egg and to be disappointed), but the hot weather is hanging on. We’re still stopping by the old swimming hole, and reflecting on the sad fact that summer is not so far gone that tragic things cannot happen. We must make extra effort to be caerfull careful. This might be a good time to consider due care, that is, our duty of care to others. In a negligence action, a plaintiff generally has to show that (1) the defendant had a duty of care in relation to the plaintiff, (2) the defendant failed to conform its conduct to the requisite standard of care; and (3) an injury to the plaintiff was proximately caused by the failure. That’s what “fisheye” is all about: Do you really want to be eating food that’s staring back at you? The duty of care is a moving target, depending to a large extent on the relationship of a defendant to the plaintiff. If someone delivering your double-anchovy pizza and atomic wings falls into an open hole in your front yard, the law treats your liability a whole lot differently than if, say, a thief sneaking around at night trying to steal your garden troll statue falls into the same hole. (But even if the law doesn’t wonder, we’re puzzled that you’d order a double-anchovy pizza). 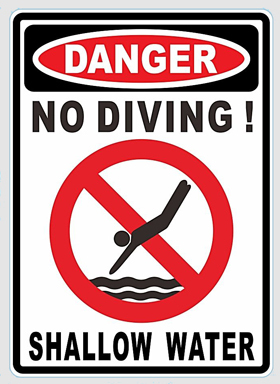 In today’s case, a young man was paralyzed for life when he dove into the lake at his parents’ house. He had made the same dive countless times before, but the defendant in the case — the non-profit corporation that owned the lake — had recently installed a dredge pipe underwater near the shore. The pipe apparently was just below the surface of the lake. The lake’s owner argued that the young man was merely a licensee, not an invitee. The difference was crucial, because a licensee pretty much takes the property in the condition he or she finds it. The trial court agreed that the plaintiff was much more than that, and after a jury trial, the young man was awarded $1 million. The appellate court looked at the corporate purpose of the non-profit lake owner, as well as the terms under which it acquired the lake from the public utility that had owned it previously. Both required that the lake be maintained for public purposes, despite being ringed with private homes, and that evidence convinced the Court of Appeals that the young man wasn’t just someone who was using the lake with the permission of the defendant non-profit corporation. Instead, he was an invitee, someone to whom an invitation had been extended to enter or remain on land for a purpose for which the land was being held open to the public. As such, the landowner had a much higher duty of care to the young swimmer, a duty it violated by not being more careful in installing and marking the dredge pipe. 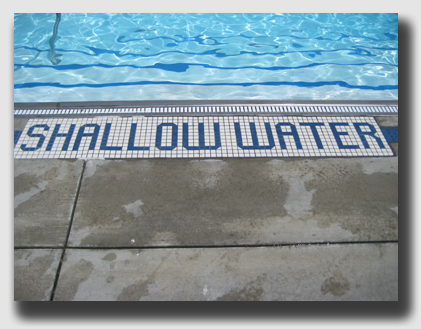 Not all shallow water is so well labeled. Shafer & Freeman Lakes Environmental Conservation Corp. v. Stichnoth, 877 N.E.2d 475 (Ct.App.Ind., 2007). Twenty-six year old Justin Stichnoth was visiting his parents at their house located on Lake Shafer. During a conversation that day, Justin’s father, Kerry, told Justin about a dredge pipe that Shafer & Freeman had installed in the channel near their dock. Kerry explained that recently he had gotten his boat “hung up” on the dredge pipe. Shortly thereafter, Justin took a running dive off of his parents’ dock into the channel, something he had done often over the years. Justin struck his head on the dredge pipe, which was located on the channel floor about 17 feet from the dock. Justin was left a paraplegic. He sued Shafer & Freeman, alleging that the firm’s negligence caused his injuries because it didn’t warn that there was a pipe underwater, it didn’t mark the pipe so that it would be visible to users of the lake, and it didn’t use reasonable care in dredging the lake. Shafer & Freeman denied the allegations of negligence. Later, it filed a motion for summary judgment on the issue of whether Justin was a licensee of Shafer & Freeman. The trial court denied it, and a jury found it liable to Justin, awarding $1 million to the injured plaintiff. Shafer & Freeman appealed. Be careful when diving into unfamiliar water. Held: Justin was an invitee. Indiana law holds that a person entering upon the land of another comes upon the land either as an invitee, licensee or trespasser. The person’s status on the land defines the nature of the duty owed by the landowner to the visitor. Licensees have a license to use the land and are privileged to enter or remain on the land by virtue of the permission of the owner or occupier, but they take the premises as they find them. Invitees, on the other hand, are owed a much higher duty of care. The decisive factor with regard to whether a landowner has extended an “invitation” or “permission” is the interpretation that a reasonable man would put upon the owner’s words and actions, given all of the surrounding circumstances. Here, the Court found, the lake was held open to the public, even though it was surrounded by private property, and thus Justin — who dove off a dock and struck his head on a dredge pipe located on channel floor — was an invitee rather than a licensee for purposes of personal injury action. The Court held that the articles of incorporation of Shafer & Freeman, the non-profit corporation that owned the lake, provided that the corporation would protect and enhance the water quality of lake in order to facilitate public recreational use and ensure continued public access. What’s more, the Court said, the agreement by which Shafer & Freeman acquired the title from the electrical utility, provided that Shafer & Freeman would hold the lake for public, charitable, recreational, conservation and environmental purposes. It is not enough, to hold land open to the public, that the public at large is permitted to enter at will upon the land for their own purposes. As in other instances of invitation, the Court said, there must be some inducement or encouragement to enter, some conduct indicating that the premises are provided and intended for public entry and use, and that the public will not merely be tolerated, but is expected and desired to come. When a landowner lets local boys play basketball on his vacant lot they are licensees only. If he installs playground equipment and posts a sign saying that the lot is open free to all children, there is then a public invitation, and those who enter in response to it are invitees.